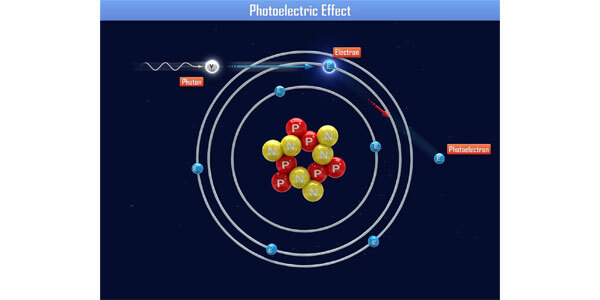 Home Edu News Photoelectric effect: Something even Einstein did not know! Photoelectric effect: Something even Einstein did not know! As we know, light is composed of photons, the energy particles of light. What happens when photons fall on a metal surface? When the metal is exposed to light, electrons will be ejected from the surface, if the energy of photons is greater than a threshold value, known as the work function. This effect, invented by Hertz, was explained by Albert Einstein with the help of quantum nature of light, for which he received the Nobel Prize in Physics in 1921. How much time will a typical photoelectric emission take? A fact that even Einstein did not actually know! Researchers of the Technical University of Munich (TUM), the Max-Planck Institute of Quantum Optics (MPQ), and the TU Wien experimentally measured the duration of photoelectric effect with the help of a measuring technique, which involves triggering a photoelectric effect by exposing X-rays to iodine atoms glued to tungsten crystal. The iodine atoms can serve as a source of light and as electron stopwatches, owing to their high reaction rate with X-rays. The experiment shows that photoelectrons from the tungsten crystal can be generated in around 40 attoseconds-billionth of billionth of a second! The researchers expect that this discovery may provide a basis for the development of new innovative high efficiency solar cells and molecular surface engineering.